5. Electricity Bill Calculation, etc. You don't want to go to Electricity Bill payment counters & don't want to waste your valuable time. Pay EB bills at any time, from anywhere. I have used this Mobile app on my Android phone; I was done my EB bill payment within 2 minutes. Here, I will explain to you how to install the TANGEDCO Mobile App in your Smart Phone & It features. 1. Search Mobile App from Google Play Store: Go to Google Play Store and enter the text "TANGEDCOMobileApp" without any space in between. TANGEDCO Mobile App Official will be listed in search criteria. 2. Install: Click Install button. The mobile app will install automatically in your Smart or Android Mobile Phone. 3. Open App: Go to your mobile "Menu" you can find the TANGEDCO Mobile App icon. Click the icon to open. 4. 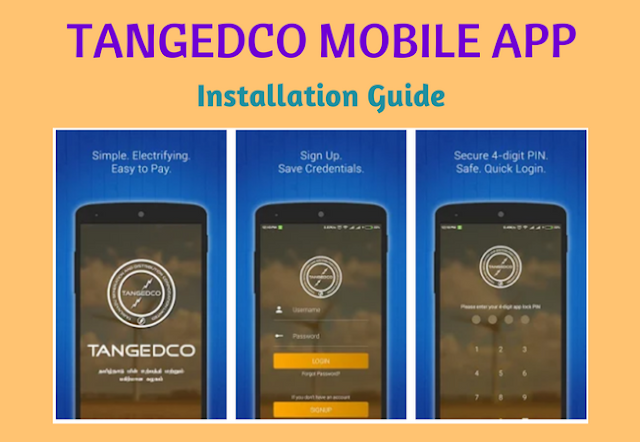 Allowing the Mobile App: The App will request you to Allow TANGEDCO to make and manage the phone calls. In next, it will request you to Allow TANGEDCO to access your photos, media, and files on your mobile device. Give the options to Allow. 5. Existing Users: If you are a user/member of TNEB official website, you can use your same TNEB login details to access the Mobile app. 6. New Users/New Registration: If you are a new user to TNEB online bill payment, Click Signup button to create an account. 7. Enter your ‘Consume Number’ and click ‘Check’ button and confirm your consumer details. 8. Setting up your login details with your Mobile number and email. 9. Verify your Mobile number by OTP (One-Time Password). 10. Login: Now the registration is completed, you can login your account by entering Username and Password. 11. Setting PIN: Set the 4-digit Mobile App lock PIN to protect your mobile app. 12. Update Profile: Now, Check and update your User Profile details. Now you can see TANGEDCO Mobile App dashboard. It will show you the various options.